Not everyone shares my view that AI is going to become a more and more important field during the coming decade. and my comments made in other discussion forums about the growth of AI. Below, I list some of the questions people have raised – along with my answers. Note: my answers below are informed by (among other sources) the 2007 book “Beyond AI: creating the conscience of the machine“, by J Storrs Hall, that I’ve just finished reading. Q1: Doesn’t significant progress with AI presuppose the indefinite continuation of Moore’s Law, which is suspect? There are three parts to my answer. First, Moore’s Law for exponential improvements in individual hardware capability seems likely to hold for at least another five years, and there are many ideas for new semiconductor innovations that would extend the trend considerably further. 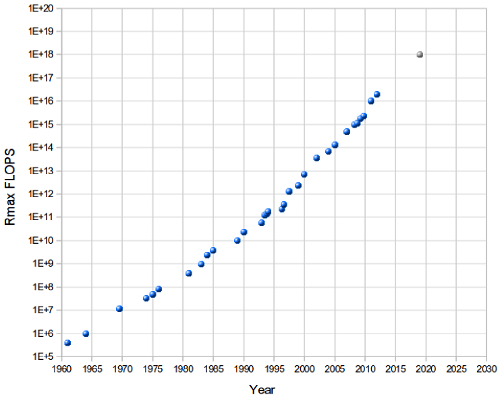 There’s a good graph of improvements in supercomputer power stretching back to 1960 on Shane Legg’s website, along with associated discussion. Moore’s Law will cease to drive semiconductor manufacturing after 2014, when the high cost of chip manufacturing equipment will make it economically unfeasible to do volume production of devices with feature sizes smaller than 18nm, according to iSuppli Corp. While further advances in shrinking process geometries can be achieved after the 20- to 18nm nodes, the rising cost of chip making equipment will relegate Moore’s Law to the laboratory and alter the fundamental economics of the semiconductor industry, iSuppli predicted. “At those nodes, the industry will start getting to the point where semiconductor manufacturing tools are too expensive to depreciate with volume production, i.e., their costs will be so high, that the value of their lifetime productivity can never justify it,” said Len Jelinek, director and chief semiconductor manufacturing iSuppli, in a statement. In other words, it remains technological possible that semiconductors can become exponentially denser even after 2014, but it is unclear that sufficient economic incentives will exist for these additional improvements. Basically, just because chip makers can keep adding cores, it doesn’t mean that the application software and the end user workloads that run on this iron will be able to take advantage of these cores (and their varied counts of processor threads) because of the difficulty of parallelising software. iSuppli is not talking about these problems, at least not today. But what the analysts at the chip watcher are pondering is the cost of each successive chip-making technology and the desire of chip makers not to go broke just to prove Moore’s Law right. At that point, says Jelinek, Moore’s Law becomes academic, and chip makers are going to extend the time they keep their process technologies in the field so they can recoup their substantial investments in process research and semiconductor manufacturing equipment. …every new technology goes over some road-bumps, especially involving start-up costs, but these tend to drop rapidly once moved into regular production. “EUV [extreme ultraviolet] will likely be the next significant technology to go through this cycle,” McGregor told us. McGregor did concede that the lifecycle of certain technologies is being extended by firms who are in some cases choosing not to migrate to every new process node, but he maintained new process tech is still the key driver of small design geometries, including memory density, logic density, power consumption, etc. “Moore’s Law also improves the cost per device and per wafer,” added McGregor, who also noted that “the industry has and will continue to go through changes because of some of the cost issues.” These include the formation of process development alliances, like IBM’s alliances, the transition to foundry manufacturing, and design for manufacturing techniques like computational lithography. “Many people have predicted the end of Moore’s Law and they have all been wrong,” sighed McGregor. The same apparently goes for those foolhardy enough to attempt to predict changes in the dynamics of the semiconductor industry. “There have always been challenges to the semiconductor technology roadmap, but for every obstacle, the industry has developed a solution and that will continue as long as we are talking about the hundreds of billion of dollars in revenue that are generated every year,” he concluded. In other words, it is likely that, given sufficient economic motivation, individual hardware performance will continue improving, at a significant rate (if, perhaps, not exponentially) throughout the coming decade. Second, it remains an open question as to how much hardware would be needed, to host an Artificial (Machine) Intelligence (“AI”) that has either human-level or hyperhuman reasoning power. Marvin Minsky, one of the doyens of AI research, has been quoted as believing that computers commonly available in universities and industry already have sufficient power to manifest human-level AI – if only we could work out how to program them in the right way. Let me, somewhat presumptuously, attempt to explain Minsky’s intuition by an analogy: a bird is our natural example of the possibility of heavier-than-air flight. Birds are immensely complex: muscles, bones, feathers, nervous systems. But we can build working airplanes with tremendously fewer moving parts. Similarly, the brain can be greatly simplified, still leaving an engine capable of general conscious thought. Arguably the biggest unknown in the technology involved in superhuman intelligence is software. Merely improving the hardware doesn’t necessarily mean the the software performance increases to match. As has been remarked, “software gets slower, more rapidly than hardware gets faster”. (This is sometimes called “Wirth’s Law”.) If your algorithms scale badly, fixing the hardware will just delay the point where your algorithms fail. So it’s not just the hardware that matters – it’s how that hardware is organised. After all, the brains of Neanderthals were larger than those of humans, but are thought to have been wired up differently to ours. Brain size itself doesn’t necessarily imply intelligence. The ability to take advantage of previous results (“to stand on the shoulders of giants”). Even if the pace slows for improvements in the hardware of individual computers, it’s still very feasible for improvements in AI to take place, on account of the other factors. Q2: Hasn’t rapid progress with AI often been foretold before, but with disappointing outcomes each time? It’s true that some of the initial forecasts of the early AI research community, from the 1950’s, have turned out to be significantly over-optimistic. I believe that in about fifty years’ time it will be possible, to programme computers… to make them play the imitation game so well that an average interrogator will not have more than 70 per cent chance of making the right identification [between a computer answering, or a human answering] after five minutes of questioning. Since the publication of that paper, some sixty years have now passed, and computers are still far from being able to consistently provide an interface comparable (in richness, subtlety, and common sense) to that of a human. The question for us today is: what reason is there to expect rapid progress with AI in (say) the next ten years, given that similar expectations in the past failed – and, indeed, the whole field eventually fell into what is known as an “AI winter“? Instead of trying to produce a programme to simulate the adult mind, why not rather try to produce one which simulates the child’s? If this were then subjected to an appropriate course of education one would obtain the adult brain. Presumably the child brain is something like a notebook as one buys it from the stationer’s. Rather little mechanism, and lots of blank sheets. (Mechanism and writing are from our point of view almost synonymous.) Our hope is that there is so little mechanism in the child brain that something like it can be easily programmed. Progress in brain sciences in the intervening years has highlighted very significant innate structure in the child brain. A child brain is far from being a blank notebook. Second, early researchers were swept along on a wave of optimism from some apparent early successes. For example, consider the “ELIZA” application that mimicked the responses of a certain school of psychotherapist, by following a series of simple pattern-matching rules. Lay people who interacted with this program frequently reported positive experiences, and assumed that the computer really was understanding their issues. Although the AI researchers knew better, at least some of them may have believed that this effect showed that more significant results were just around the corner. There were similar changes in funding climate in the US, with changes of opinion within DARPA. Shortly afterwards, the growth of the PC and general IT market provided attractive alternative career targets for many of the bright researchers who might previously have considered devoting themselves to AI research. To summarise, the field suffered an understandable backlash against its over-inflated early optimism and exaggerated hype. On that note, let’s turn to the fourth factor in that list. Q3: Isn’t AI now seen as a relatively uninteresting field, with few incentives for people to enter it? The question is: what’s going to cause bright researchers to devote sufficient time and energy to progressing AI – given that there are so many other interesting and rewarding fields of study? Part of the answer is to point out that the potential number of people working in this field is, today, larger than ever before – simply due to the rapid increase in the number of IT-literate graduates around the world. Globally, there are greater numbers of science and engineering graduates from universities (including China and India) than ever before. The constant need to improve the interface to large search databases, so that users can more quickly find material. Since there is big money to be made from progressing solutions in each of these areas, we can assume that companies will be making some significant investments in the associated technology. Once a baby [artificial] brain does advance far enough that it has clearly surpassed the bootstrap fallacy point… it might affect AI like the Wright brothers’  Paris demonstrations of their flying machines did a century ago. After ignoring their successful first flight for years, the scientific community finally acknowleged it. Aviation went from a screwball hobby to the rage of the age and kept that cachet for decades. In particular, the amount of development took off enormously. If we can expect a faint echo of that from AI, the early, primitive general learning systems will focus research considerably and will attract a lot of new resources. As well as making a case that progress in AI has been significant, another of the main theme of J Storrs Hall’s book “Beyond AI: Creating the conscience of the machine” is the question of whether hyperhuman AIs would be more moral than humans as well as more intelligent. The conclusion of his argument is, yes, these new brains will probably have a higher quality of ethical behaviour than humans have generally exhibited. The final third of his book covers that topic, in a generally convincing way: he has a compelling analysis of topics such as free-will, self-awareness, conscious introspection, and the role of ethical frameworks to avoid destructive aspects of free-riders. However, critically, it all depends on how these great brains are set up with regard to core purpose, and there are no easy answers. If you get lists from 37 different mobile industry analysts of “five game-changing mobile trends for the next decade“, how many overlaps will there be? And will the most important ideas be found in the “bell” of the aggregated curve of predictions, or instead in the tails of the curve? Robert Rice predicted “Artificial Life + Intelligent Agents (holographic personalities)”. For example, these companion devices will be able to make good recommendations (e.g. mobile content, or activities) for us, suggest corrections and improvements to what we are trying to do, and generally make us smarter all-round. Sculley was enamored with Newton, especially Newton Intelligence, which allowed the software to anticipate the behavior of the user and act on those assumptions. For example, Newton would filter an AppleLink email, hyperlink all of the names to the address book, search the email for dates and times, and ask the user if it should schedule an event. As we now know, the Apple Newton fell seriously short of expectation. The performance of “intelligent assistance” became something of a joke. However, there’s nothing wrong with the concept itself. It just turned out to be a lot harder to implement than originally imagined. The passage of time is bringing us closer to actual useful systems. The set of items shown in “context sensitve menus” often seems a much smarter fit to my needs, nowadays, than it did when the concept was first introduced. On mobile, search is frequently further improved by subsetting results depending on location. As another example, typing a few characters into the home screen of the Nokia E72 smartphone results in a list of possible actions for people whose contact details match what’s been typed. Improving the user experience with increasingly complex mobile devices, therefore, will depend not just on clearer graphical interfaces (though that will help too), but on powerful search engines that are able to draw upon contextual information about the user and his/her purpose. Over time, it’s likely that our mobile devices will be constantly carrying out background processing of clues, making sense of visual and audio data from the environment – including processing the stream of nearby spoken conversation. With the right algorithms, and with powerful hardware capabilities – and provided issues of security and privacy are handled in a satisfactory way – our devices will fulfill more and more of the vision of being a “personal digital assistant”. That’s part of what I mean when I describe the 2010’s as “the decade of nanotechnology and AI”. It’s the end of the decade and for many of us it has been a very actively ‘mobile’ decade, a lot of the efforts and projects of our peers have become real and succesful during this decade. As for the start of a new decade, I’ve had this idea of asking some of the people I met during the last decade to write down their five game-changing mobile trends for the next decade. The format is to list your 5 trends for the next decade, in words, a sentence or a pagaraph, no links. Mobiles manifesting AI – fulfilling, at last, the vision of “personal digital assistants”. Powerful, easily wearable head-mounted accessories: audio, visual, and more. Mobiles as gateways into vivid virtual reality – present-day AR is just the beginning. Mobiles monitoring personal health – the second brains of our personal networks. No fewer than 37 different people from throughout the mobile and IT industries contributed answers. The entire set of answers is now available for viewing on Rudy’s m-trends.org blog and is also posted onto slideshare.net, from where you can download a PDF version. Each of the 37 sets of answers has at least one item (usually more!) that’s a good conversation starter. The ongoing “#m2020” dialog that Rudy has started is likely to cast a long shadow. The communications revolution accelerates, destroying businesses that refuse to think the unthinkable. No-one predicted the loosening of time and space that Mimi Ito has noted. Similarly, what happens to our social arrangements when every photo can be face-recognised, geolocated and individuals tracked? What happens to shops when every price can be compared? What happens to conversation when it’s all recorded, or any fact is a 5-second voice-search away from being checked? Ubiquity of mobile broadband will lead to an explosion of connected devices (à la Kindle, not just phones) and M2M services (machines to machine services, without a human behind the device). In 10 year, there will be more devices/machines connected to the mobile network than humans. Non-humans (objects, animals, places) will generate more data than humans. Keyboard dimensions and screen size cease to be the primary limiting factors in handset design as new input and display technologies free designers to radically change the form factor of personal communication devices. Convergence of physical, augmented and virtual reality: augmented and virtual reality will become an increasingly standard method for search, discovery, gaming, eyesight, healthcare, retail, entertainment and most other experiences in life. Location and other contextual functions will grow so our 2D mobile experiences become 3D and ‘real’. To such an extent that the prefixes ‘augmented’ and ‘virtual’ will eventually become redundant. The items I’ve picked out above are just scratching the surface. There’s much, much more to read and ponder in the entire slideshow – click over to Rudy’s blog to explore further!